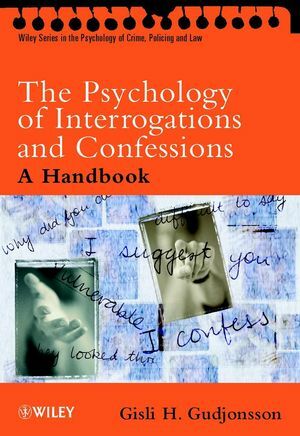 This volume, a sequel to The Psychology of Interrogations, Confessions and Testimony which is widely acclaimed by both scientists and practitioners, brings the field completely up-to-date and focuses in particular on aspects of vulnerability, confabulation and false confessions. The is an unrivalled integration of scientific knowledge of the psychological processes and research relating to interrogation, with the practical investigative and legal issues that bear upon obtaining, and using in court, evidence from interrogations of suspects. PART I: INTERROGATIONS AND CONFESSIONS. Persons at Risk During Interviews in Police Custody: the Royal Commission Studies. The Identification and Measurement of 'Oppressive' Police Interviewing Tactics in Britain. Why do Suspects Confess? Theories. Why do Suspects Confess? Empirical Findings. Miscarriages of Justice and False Confessions. The Psychology of False Confession: Research and Theoretical Issues. The Psychology of False Confession: Case Examples. PART II: LEGAL AND PSYCHOLOGICAL ASPECTS. The English Law on Confessions. The American Law on Confessions. Suggestibility: Historical and Theoretical Aspects. PART III: BRITISH COURT OF APPEAL CASES. The Effects of Drugs and Alcohol Upon the Reliability of Testimony. The 'Guildford Four' and the 'Birmingham Six'. PART IV: FOREIGN CASES OF DISPUTED CONFESSIONS. Four High Profile American Cases. Murder in Norway: a False Belief Leading to a False Confession.